Dave's Part: Iraq withdrawal: in the next few weeks? 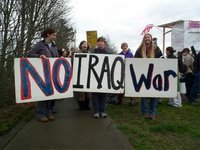 Iraq withdrawal: in the next few weeks? I have no idea what view Mick Smith of The Times privately takes of the war on Iraq. But having spoken to him on the phone on a few occasions, I can vouch for the fact that he is both a nice guy and pretty damn savvy on matters military. So I was interested to read a recent post on his blog, speculating that coalition withdrawal from Iraq will be happening sooner rather than later. 'I think that each of the provinces, each of Iraq's 18 provinces will be looked at entirely on its own merits. But I would have thought that this is a process that could start in the pretty near future. 'I also think that it is a process that an incoming Iraqi government would be extremely keen to see underway in order that it can demonstrate its own sovereignty in its own country. Mick interprets that as meaning that a phased withdrawal is likely to start in the next few weeks, once the Malaki government is in place, and that it will take between 18 months and two years to complete. Good news for those of us who thought the war should never have commenced in the first place.